(UKWMS-2/10/2018) Lately, beet, or whose Latin’s name is Beta vulgaris, are often sought and consumed by many people because of the compounds contained inside that are good for the body, which are very rich in antioxidant. In addition to health benefits, beet also have other benefits, which is a coloring agent in cosmetics. 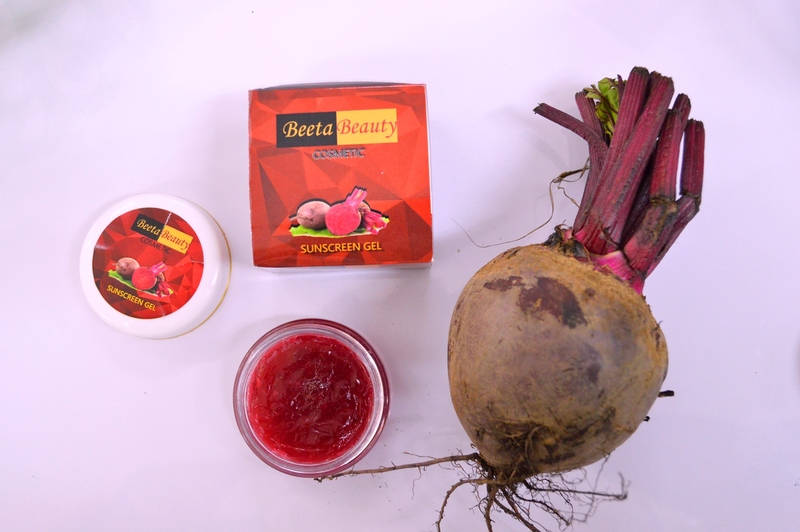 But there are no skincare cosmetics made from beet yet, even though beet have the potential to be developed into a useful skincare product and have a high selling power. 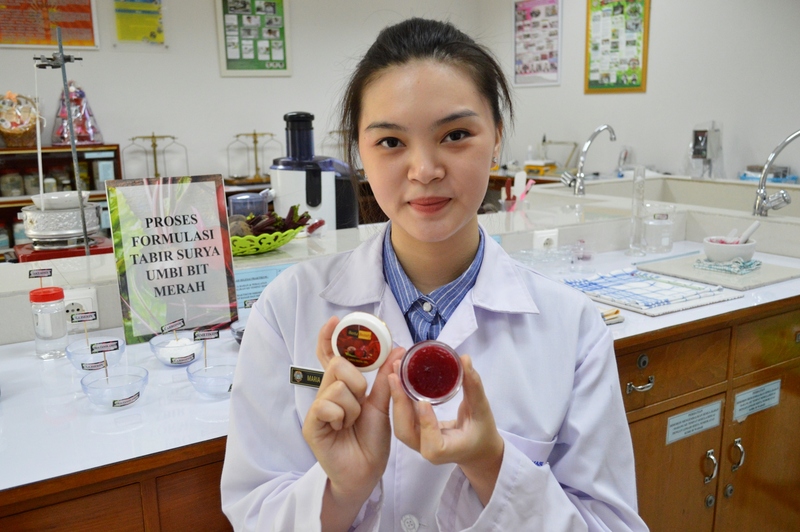 This golden opportunity inspired Maria Gracela, a student from Widya Mandala Catholic University of Surabaya’s Faculty of Pharmacy to make sunscreen gel made from beet, and she named her product BEETA BEAUTY. Ultra violet rays from the sun that are exposed directly onto the skin continuously can cause damage to skin. Sunscreen is a skincare product that functions to protect skin from sun exposure. “According to research, beet contain a fairly high betalain compound, which is around 127.7 mg per 100 g of fresh red beet. This compound serves as an antidote to free radicals, and one of those free radicals is an excessive exposure to UV light that can harm skin. “That’s the main reason for using beet for sunscreen,” according to Maria. Of course this product is a breath of fresh air to research in beet as a skincare product. The raw material of this product is a standardized red beet extract to guarantee its quality. Maria tells us that beet plants are easy to find, such as in agro business centers and some traditional markets in Surabaya, like the Keputran market. For one sunscreen product, it takes approximately 350 grams or about 2-4 beet bulbs. The formula used in this study refers to previous studies with gel bases. “Base gel is chosen because it has the characteristics of giving a cool effect after being used and easily applied to and absorbed by the skin,” said Maria. In this study she was guided by Farida Lanawati Darsono, S.Si., MSc. and Dra. Hj. Liliek S. Hermanu, MS., Apt. The production of this product begins with the making of thick extracts from beets. After the extract is obtained, then additional ingredients are added, such as gelling agent, humectant, water-resistant agent, and preservatives. Making extracts takes about 24 hours because the extraction temperature must be maintained. The making of the gel sunscreen itself does not require a long time — perhaps only about 30 minutes. Through pH test, viscosity, homogeneity, dispersion, adhesion and irritation, BEETA BEAUTY meets the standards safe for use directly on the skin. The appearance is distinctive with purplish red and a slightly sweet smell of beet. If smeared, this sunscreen gel will make the skin look clean and flushed red as a sign of health and cheerfulness of the skin due to the gel’s antioxidant effect. “The production of extracts must be maintained because the active compounds in beets do not hold heat over 70 °C. If the degree is higher than that, the extract color will become brown. This shows that antioxidant compounds have been damaged,” Maria said when explaining about the difficulties encountered in making this product. Products tested on this laboratory scale have been tested with dozens of panelists — one of them named Flaviana. “The gel is not sticky, it feels cool and also doesn’t leave red color on the skin,” Flaviana said about BEETA BEAUTY.